This page will tell a partition tool with which you are able to extend the C drive space without deleting or moving any data on Windows 2003. Download IM-Magic Partition Resizer Server to increase size of Windows Server 2003 C drive without touching data stored on the disk. Probably, you can delete or move files to free up disk space on C drive when it is running on low disk space on Windows Server 2003, but it cannot solve the low disk space problem thoroughly. Or you may repartition hard disk to reallocate disk, but you may need to backup important data. Otherwise, you may lose data after repartitioning hard disk. Now, if you can use IM-Magic Partition Resizer Server, you can extend C drive space on Windows Server 2003 without repartitioning disk or deleting any data. You do not need to worry about data loss by using this partition software. Move the arrows to extend the C drive and click "Apply" button. "I receive low disk space warning message on C drive when I boot my Windows Server 2003 computer. 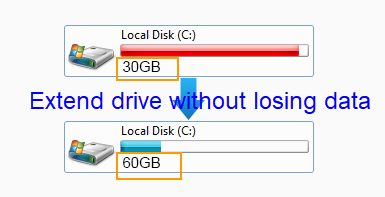 System asks me to delete some unnecessary files, but I am wondering if I can find a way to increase the size of C drive without deleting any data. Can somebody give me a clue?" "I am looking for a solution for C drive expanding on Windows Server 2003, but Diskpart command failed to extend C drive. I need to extend C drive on Windows 2003 because the low disk space problem has affected the performance of my computer. Thanks for any kind advice for C drive resizing without touching any data on Windows Server 2003." Without relying on any partition software, you can delete some unnecessary files. Or you can move some files to another partition or other storage media. You can open Disk Cleanup tool to cleanup disk space on C drive on Windows Server 2003. Windows 2003 built-in Diskpart command has the ability to extend disk partition. You can move all important data to another storage media like external hard disk, and then repartition the hard disk to reallocate disk space. Although you may try the solution above to fix low disk space on Windows Server 2003, all solutions above have their limitations. For example, deleting or moving files cannot repair the low disk space problem thoroughly. Diskpart command only allows you to extend a data volume which has NTFS file system. Besides, adjacent unallocated space is always needed when you want to run Diskpart command to extend a partition. Because of those limitations, the best way to fix low disk space on C drive on Windows Server 2003 is to use partition software. By using this partition software, you can extend C drive without repartitioning hard disk or deleting any data. You just need to move the mouse and perform several mouse drags so as to get C drive extended. 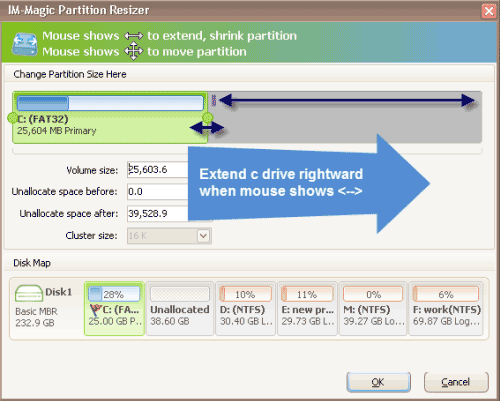 This partition software provides a safe way to extend C drive space without affecting any data on the original place.